Frederic Sackrider Remington was born on October 4, 1861 in Canton, New York. He was an American writer, sculptor, illustrator and painter who specialized in painting the American West of old, primarily during the 19th century, featuring the U.S. Cavalry, American Indians and American cowboys. He came from a prominent and well-connected family. His maternal family were founders of Windsor, Connecticut while his father was a colonel in the American Civil War with English blood lines. He was related to Earl W. Bascom, a cowboy sculptor and George Catlin, an Indian portrait artist. He was a cousin of the founder of the oldest gunmaker in America, Eliphalet Remington of Remington Arms Company. He was also related to Robert “Doc” Newell, Jonathan T. Warner, Jedediah S. Smith and General George Washington, who became the first president of the United States. Frederic Remington was closely identified with the Wild West in America and became the most famous artist of American cowboys. He briefly took lessons at Yale Art School and spent several years in the former American territories. He became an illustrator of the frontier life for several magazines including Harper’s Weekly, which solidified his reputation. He was the genre specialist of that period, producing thousands of artworks – oils, watercolors, lithographs and sketches of the life of cowboys, including the western frontier, Indians, horses and the military. 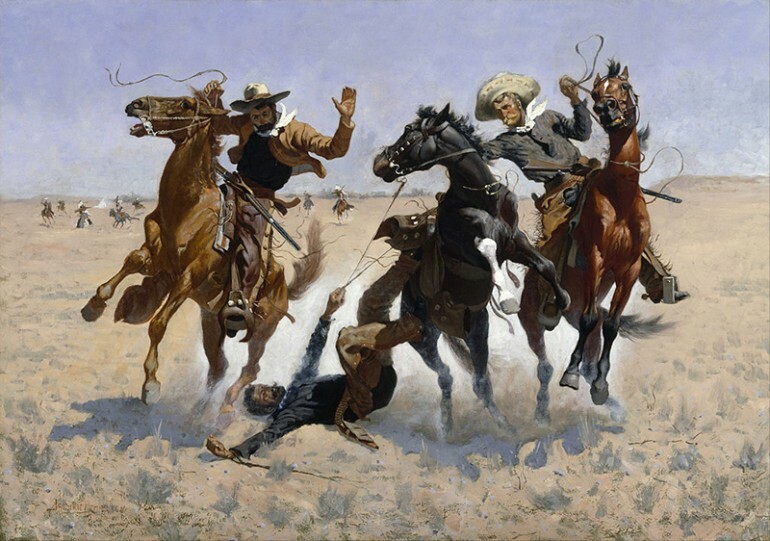 Many of his works became the most important genre paintings of the Wild West that were ever produced. Remington also tried his hand at sculpture and one of his major works, a bronze sculpture called the “Bronco Buster” is believed to have had more than 300 casts. 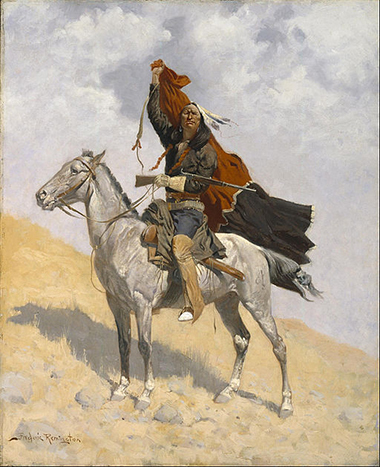 Several of his watercolors and drawings, about 80 oil paintings and 16 sculptures in bronze are displayed at the Frederic Remington Art Museum located in Ogdensburg, New York. He was a major artist during his career and also had the reputation for being a correspondent and writer who had covered the Indian Wars in 1890 and 1891 as well as the Spanish-American War in 1898. It is believed that his love for the outdoors and the lives in the western frontiers was inspired by the stories he heard from his father who was then serving in the U.S. Army. While he enjoyed hunting, boating, fishing and riding, for which his family was known for, he was also very interested in drawing and spent a major part of his daily life sketching soldiers, especially when they were wearing their uniforms. He was sent to military school by his father but did not last long. He also took art lessons but was not keen on repeatedly drawing from casts and still lifes. His first trip to Montana in 1881 opened his eyes to the huge prairie lands, where herds of buffalo were able to roam freely. He also came in contact with the Cavalry and Indians, just the way he dreamt it during his boyhood. This initial experience was what shaped his artistic future. In the 1890s he started sculpture, initially working in the traditional sand cast method before turning to the lost wax technique. While he created 21 sculptures in bronze, the Bronco Buster that he created in 1895 was the most famous. It showed a very brave cowboy desperately trying not to fall off a rearing horse. The original cast is at the Oval Office of the White House. A version that was created in 1909 is part of the permanent collection of New York’s Metropolitan Museum of Art. Towards the end of his life, Remington focused on sculptures and painting and quit illustration work. Inspired by Impressionism, his painting techniques become looser. Due to his health, he regretted that he was not able to do plein air painting. He died at age 48, with 25 years of his life spent as an artist. He produced more than 3,000 paintings and sketches and 22 sculptures. He also finished a novel, wrote several articles as well as plays. One of his illustrations was used for the very first Marlboro Man cigarette advertisement.